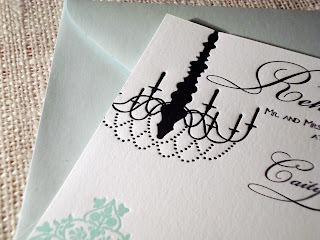 Flutter Letterpress: Practice, Practice, Practice! It's true what they say, Practice Makes Perfect! Yes, I myself hate those cliche phrases, but in this case, it's 100% true. I've learned a couple things through this design that I would like to share with you all. 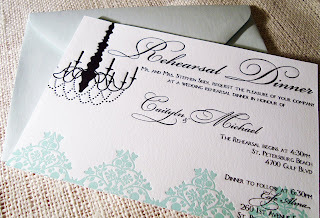 1) This, my dear friends, is my baby brother & his Fiance's rehearsal dinner invitations. I had full intentions to design this, print it, and send them on their merry way (only to receive one in the mail very soon- YES!) until I realized that... this may actually be happening. My baby brother (and when I mean baby, I mean to say we're practically Irish-twins with less than 11 months separating us, but still, he's my younger half...) is getting married. It's an interesting prospect. I was just married- it didn't effect me that I would be moving on, but in this case, he actually IS moving on. Perhaps to another state-- a FAR FAR AWAY state. It's going to be weird. I'm none the less happy for them, but... well you get the idea. 2) This design may go in history as the most simple yet hardest to print design. Ever. Yes folks, it's true- I went through 65 pieces of paper to get 30 good prints. Want to know why? DO YA? It's that chandelier. That beautiful, dangly, and deceptively murderous chandelier. Whats that you say, Professor Plum in the bathroom with the chandelier? Yes folks- I nearly broke down crying over that black, hand drawn, monstrous thing. I wasn't getting ANY solid prints no matter how much ink I used (and lettra is NOTORIOUS for drinking ink) or dampening of the paper I did. Ugh. Of course, I prevailed. I should rather say that Atticus prevailed. He, being one of the greatest loves of my life, brought his new stuffed moose-toy into the studio and lovingly layed it near Gable while I was furiously printing. Of course, I had to remove the moose before serious damage was done, and in doing so, left an already once-printed invitation on the press to reach down and grab the precariously perched moose (as an aside, I am very careful about things moving around while I print- it's a dangerous machine, and I don't play games with safety in the studio...). Atticus is so nice to leave such gifts. The press made a double impression on the same invitation. When you hear a joke that starts with a Great Dane, a Stuffed Moose, and saving the day-- listen. It's based on a true story. The invitations were finished shortly after and I'm so happy for my baby brother! Congratulations Mike and Caitlyn-- See you soon in Tampa! Please! Boston is freezing and the husband won't let me turn the heat up!